Amongst all communities here in Dubai, JLT is my favourite. Not only that I get to spend 5 days in a week in this area (I've been working here since October 2014) watching yet another man-made lake lake sitting nicely under the sun but this part of the city has turned into a culinary melting pot with over a hundred flavours to choose from. Bahraini cuisine is just one of them. They have an outside seating area for Al Fresco diners, a view of the Marina buildings, and a playground below it. It is somewhere at the corner of HDS Tower in Cluster F, you may need to take the stairs nearest Zoom supermarket and going past other restaurants like Inn Lay Asia and Richy's. Like I always do, I ordered one of the best sellers: Super Food salad and mixed shawarma platter served with hummus, bread, and green salad on the side. My room mate had a Malghoom shawarma meal that comes with spicy fries and drink. Desserts were red velvet and strawberry cheesecake. They have great spicy fries nicely cut in mini-strings. Hummus is undeniably good - thick and ultra smooth, without any weird textures. Bread (the one served with the platter and the one used for the shawarma wrap) was freshly baked. Unlike other doner and shawarma restaurant, their meat were salted just right. NEVER. EVER. MISS. THEIR. GARLIC HERB SAUCE. It's a must, I repeat, it's a must. The greens on their salads are fresh and crunchy. Good value for money, you can spend as little as 50AED for a complete meal with desserts. And the meal was heavy for one person. I have tried one of the best sellers, the Super Food salad. Quite surprised that it has edamame beans in it, I particularly love the balsamic dressing which is not overly sour unlike any other. Room mate on the other hand loved his Malghoom shawarma meal and he recommends ordering this with a bottle of Yasalam's freshly squeezed pomegranate juice to neutralise the flavour. 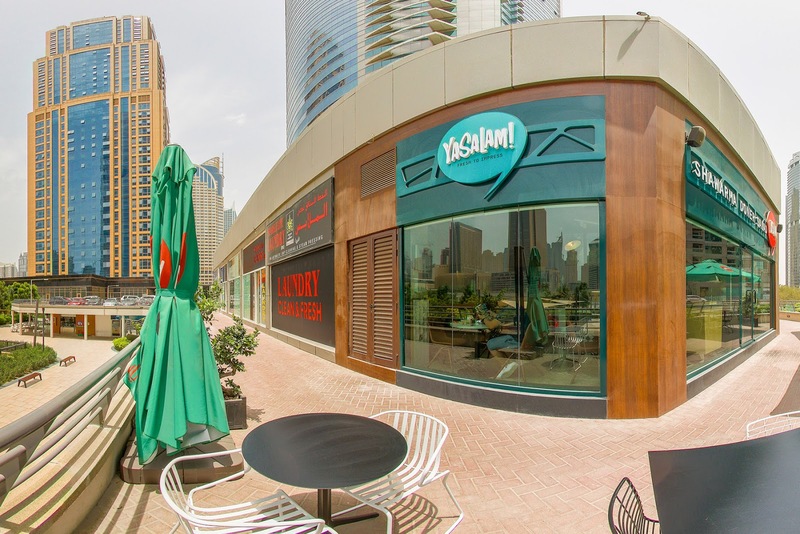 Yasalam Restaurant serves a wide range of Bahraini cuisines including salads, shawarma and doner wraps or platters, and has a branch in HDS Tower Cluster F JLT. They also deliver when necessary, please call 800 YASALAM or 04 2753184 for more information. Disclaimer: We were invited to sample the menu at this restaurant. Opinion and photos are my own.